Hanoi transport authorities have not been able to take full advantage of the cameras installed on local streets. Many surveillance cameras have been installed on Hanoi's streets. 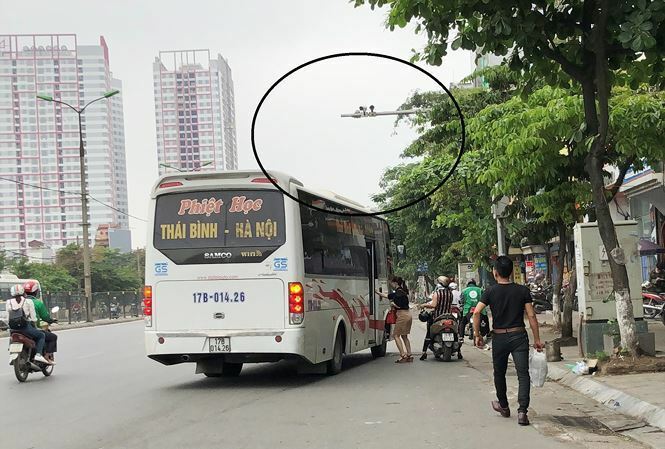 In early 2018, the Department of Transport and Department of Public Security installed more cameras near Giap Bat Bus Station to prevent violations. However, it has proved to be ineffective as many passenger buses still randomly drop and pick up passengers. From 10 am to 12 pm on April 10, dozens of buses were seen dropping and picking up passengers on Giai Phong and Kim Dong streets. Some people even gather and wait for the buses right under the cameras. After the bus rapid transit route was set up along Le Van Luong Street, cameras have been installed to prevent other vehicles from entering the separate bus lane. However, according to Hanoi Urban Transport Management and Operation Centre and the Bus Rapid Transit Co-operative, the cameras have only been used to count the number of vehicles that trespass on the bus lane. Only when there is a serious violation that affects the operation of the BRT buses and other vehicles that the camera operation centre will send the images to the traffic police to fine the violators. Since violators are not fined quickly enough, many have disregarded the cameras and freely use the lane. The cameras have also been installed along the Ring Road 3. However, whenever an accident involving passenger buses occurs, instead of using the cameras, the police have to find witnesses and investigate the crime scene which sometimes fails to provide vital evidence. Many people have raised questions on whether the cameras are broken or there is a lack of co-operation between different parties and agencies. Than Van Thanh, former chief of the National Traffic Safety Committee, said there were no cameras at several hot spots in Hanoi such as in front of Bach Mai Hospital, around My Dinh Bus Station or Hanoi Railway Station. According to him, hundreds of billions of VND had gone to waste as the camera system yields little results. Few violators have been fined and it has failed to raise public awareness about traffic safety or become a deterrent. Bui Danh Lien, deputy head of Hanoi Transport Association, called on the government to review the investment into the CCTV cameras.